Being an on-call substitute teacher has its pros and cons. One of the bittersweet parts is the fact that some days you just don’t get a job. This is a con because, of course, you don’t get paid, but it’s a pro because it’s a good opportunity to do things during weekday afternoons that you wouldn’t usually get to do. One of those things is visiting food trucks at their lunch stops. The week of Thanksgiving, the school district where I work was on break the entire week, so I took full advantage of the opportunity to hit up some local food trucks that I don’t usually get to see during the week. 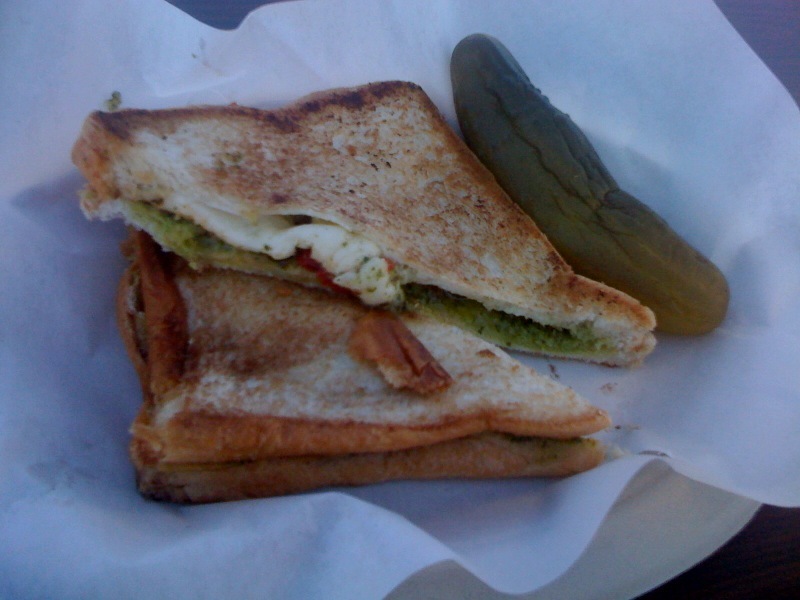 My first stop was for lunch on Tuesday when I met up with my boyfriend to get some grilled cheese at Gourmet Rockstars. They are now spending every single day at the great mall in Milpitas, both for lunch and dinner. This was another one of my blogger fails where I got so excited about eating the food that I forgot to take a photo of it ahead of time. Luckily I’ve written about this truck before! 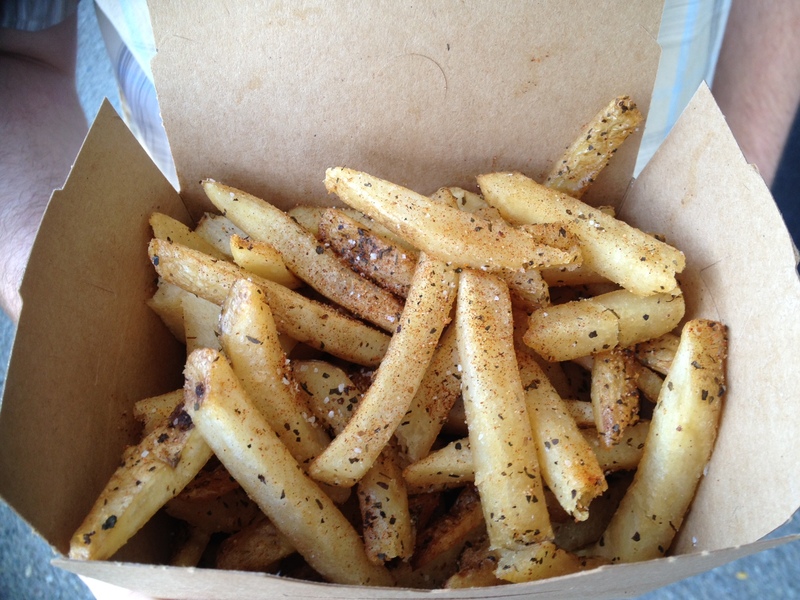 I did manage to get a photo of my boyfriend’s cajun fries before they were devoured though. 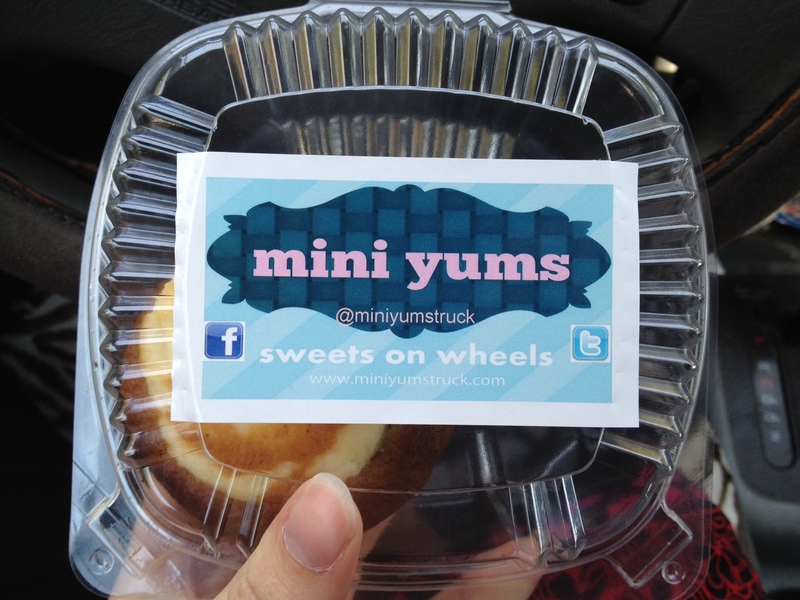 From there, I ventured on my own to a new truck to the area (although from their website it appears as though they’ve been at it for awhile in L.A.), Mini Yums. They had a window that displayed all their tasty treats, making it even harder to choose than looking at a menu would be! I narrowed my choices down to two, despite being full from lunch. 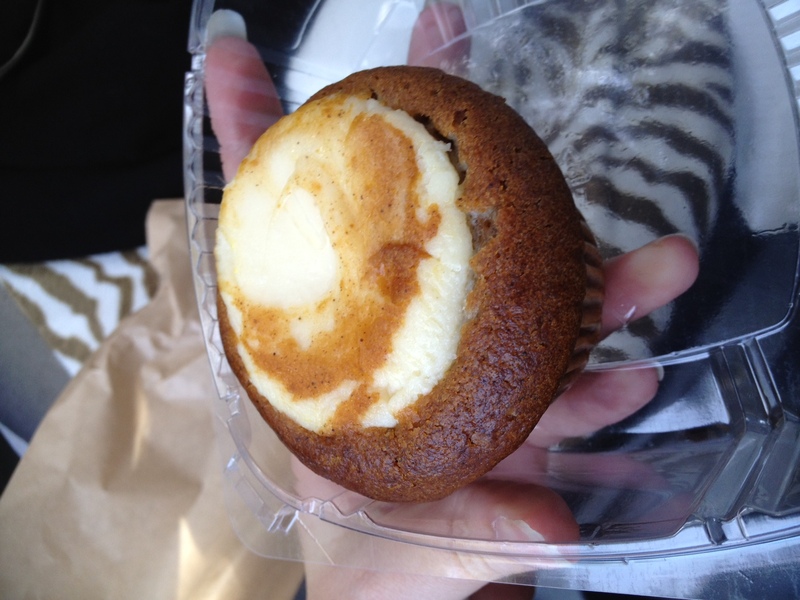 I went with the brownie (I forget what kind of nut was in it) and the pumpkin cream cheese cupcake. 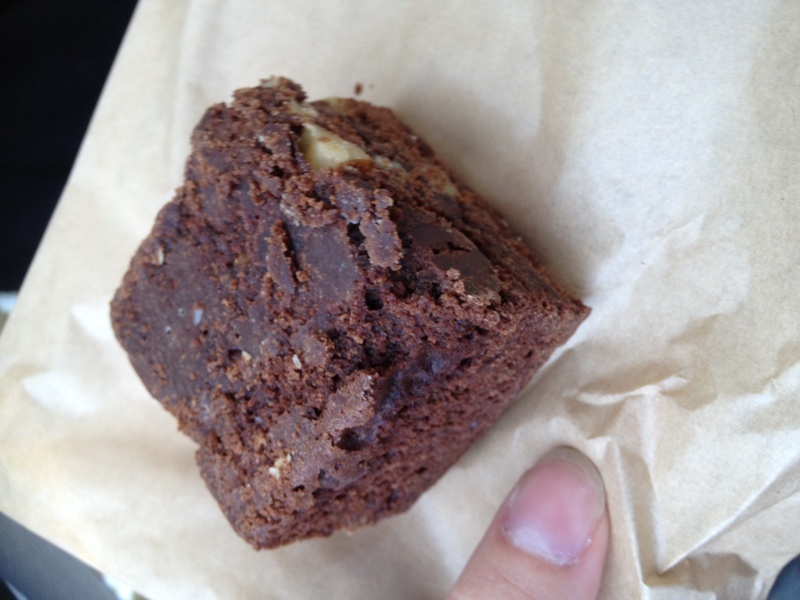 I ate the brownie during my drive home and saved the cupcake for later. The cupcake ended up lasting me for dessert after two separate meals because it was so big and sweet. You know me and pumpkin; I just can’t get enough. The cupcake also came in a container that had a cute label with the Mini Yums logo on it. 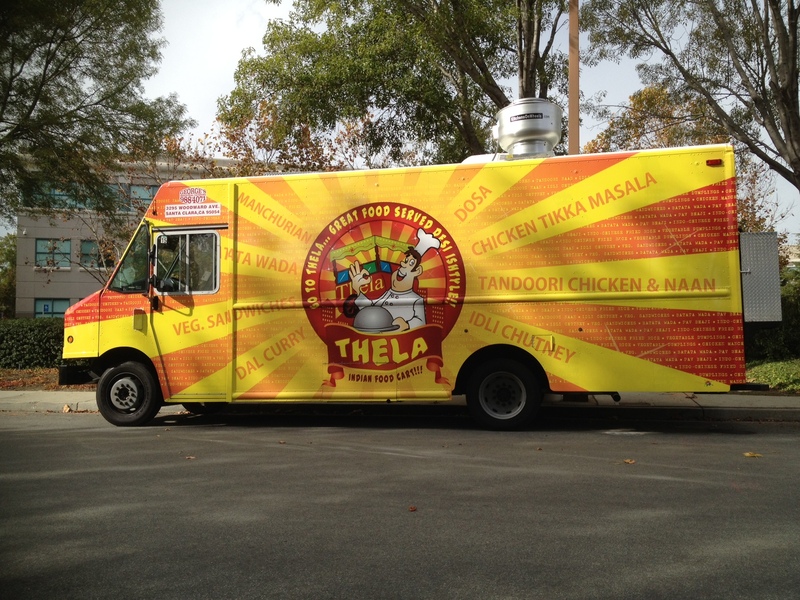 The next day I ventured out to try a new food truck on the streets, Thela. This was the first food truck I’ve been to that didn’t include tax already in their prices. This wouldn’t bother me so much if their food stood out, but I’m sad to say it didn’t. 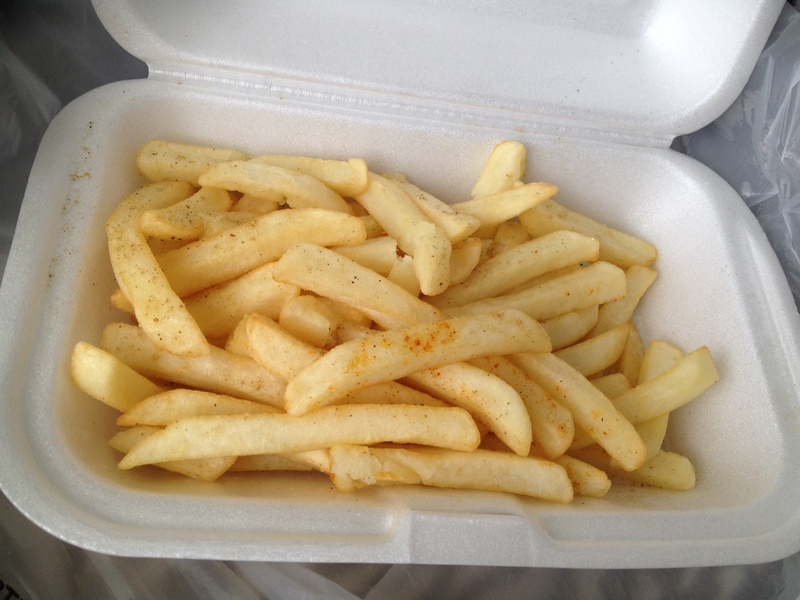 I ordered the masala veg burger, which came with an entire container of fries on the side. 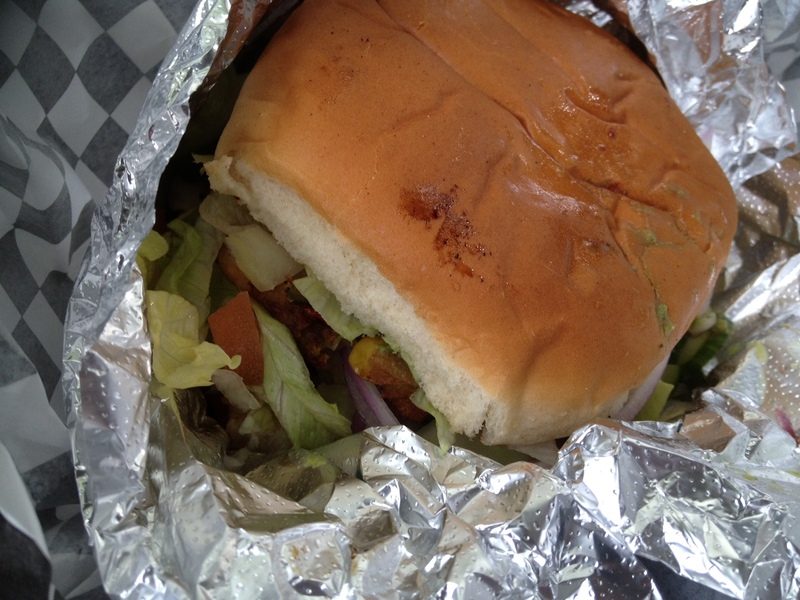 I was excited to try a veggie burger with an Indian spin, and all the veggies on it made me optimistic. Unfortunately, it was served cold, and despite the veggies it lacked in flavor. 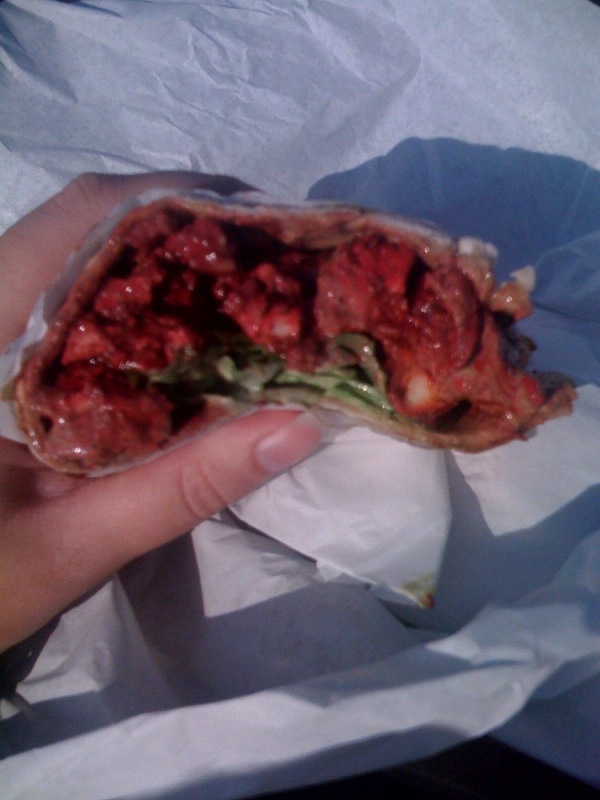 The veggie patty also fell apart easily, which is something I’ve never experienced with a veggie burger before. The fries definitely helped. They were warm and plentiful, but nothing really stood out about them. Being a new truck, they might just need to get some of the kinks worked out. Or maybe I would have more luck with a more traditionally Indian menu option. 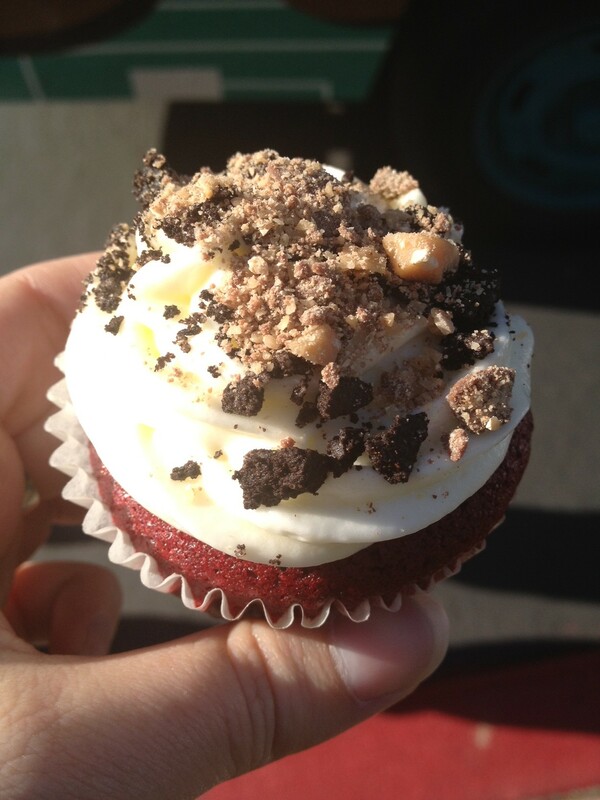 Afterward, I tried to hunt down the Project Cupcake truck but couldn’t find them. I found out today that that was because they only venture out every other week. Duly noted for future daytime trucking outings! Speaking of today, I didn’t get a job today, so I set out to find some more trucks. 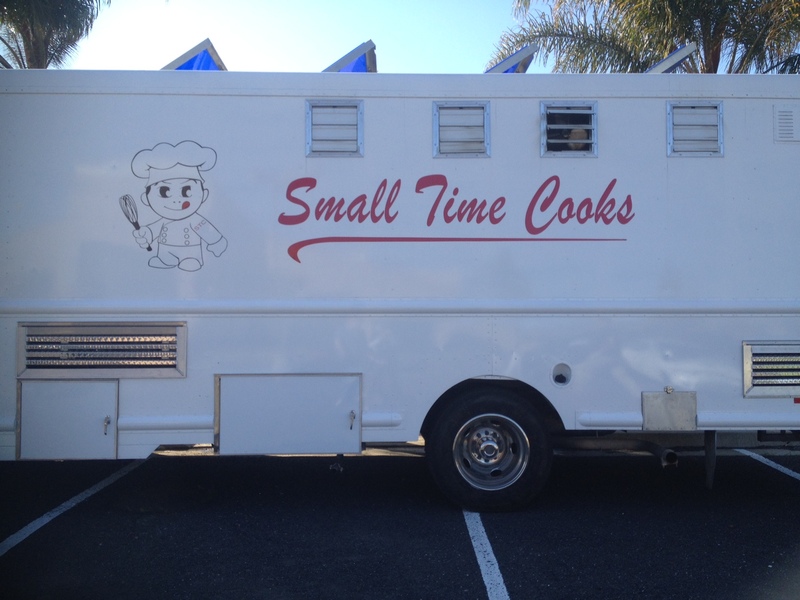 This time my first stop was another meeting with my boyfriend at Small Time Cooks, a new truck I wouldn’t have known about if they hadn’t tweeted at me. They’re at the same location every day in Milpitas from 11-3. 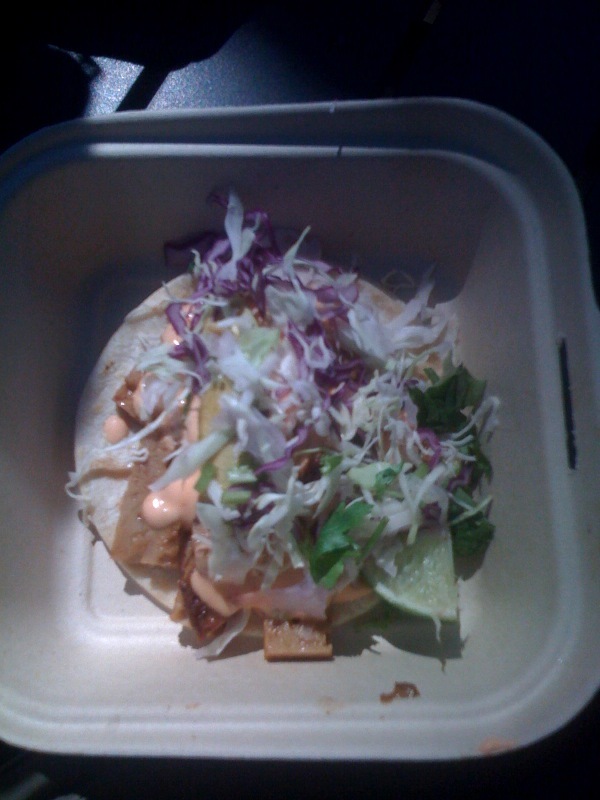 Being a new truck, they gave us samples of their two veg options, paneer tikka masala and mushroom tofu tacos. 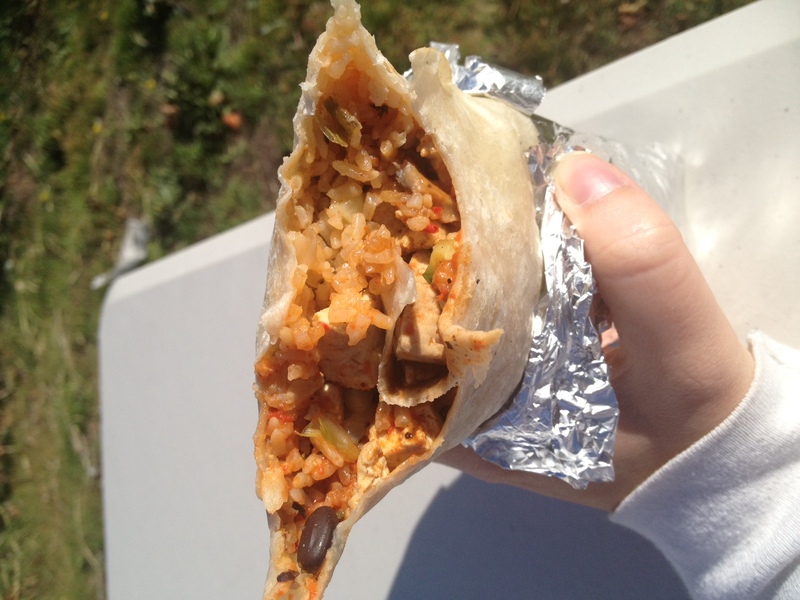 I once again forgot to take a photo of our samples, but when I decided on the mushroom tofu burrito I did manage to take a photo of that! We were both impressed by how flavorful both veg options were. My boyfriend even commented that the tacos might be his favorite from a truck he’s tried yet! We hope to see more of this truck as they continue to grow. From there, I made my way to another Project Cupcake location, determined to build my own cupcake this time. I found them at the Tivo offices in Alviso, and the owner was impressed that I had hunted them down. I chose a red velvet cupcake with cream cheese frosting this time, but I think I chose the exact same toppings as last time. When you find something yummy, why not stick with it? Many thanks to the food trucks in the area for making my days without work enjoyable! Oops, it’s been two weeks since my last post. There’s a whole lot of newness going on in my life. I have a new job and a new boyfriend, and all the new Fall teeevee is eating up my schedule. Despite not yet learning how to efficiently budget my time to allow blogging on a regular basis, I have still been frequenting the local food trucks. Luckily, there have been plenty of new trucks in my last two weeks too! I’m going to start with Newark Street Eats, a gathering I’ve opted to go to the last two Mondays in lieu of Edgewood Eats, mainly due to the fact that I work in Newark. I look forward to when Edgewood moves to Tuesday so I don’t have to choose anymore. However, it will also only be once a month at that point, which makes me sad. Each of the two Newark Street Eats I’ve been to recently has provided me with the opportunity to try a new truck. 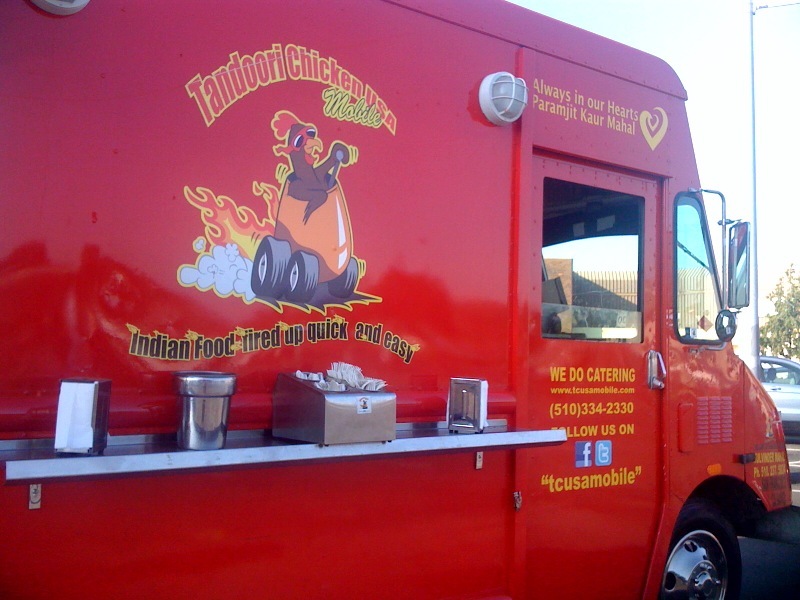 First, there was the September 12th Newark Street Eats when I ate at a truck I’d never even heard of before, and with possibly the longest name I’ve heard for a food truck, Tandoori Chicken USA Mobile. I ordered a paneer sandwich. It was super spicy and very filling. It also made a mess, to the point where I needed about ten napkins. As I’ve stated previously though, I don’t find this to be a bad thing. 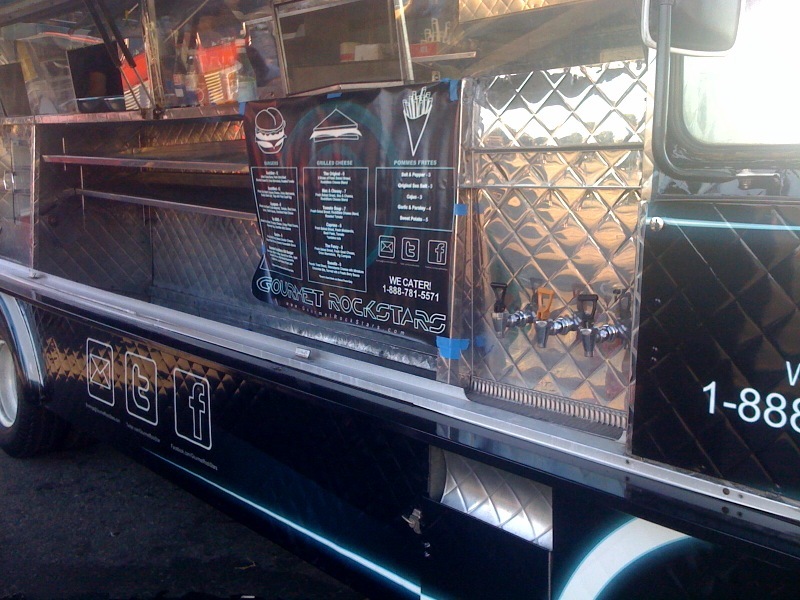 This week’s Newark Street Eats featured another new truck I hadn’t been to before, Gourmet Rockstars. I ordered the caprese grilled cheese. I think I have written about my love for pesto before, but I would just like to state for the record that pesto is the besto. And when you mix it with sundried tomatoes and mozzarella? Even better (besto-er?). It also came with a delicious fresh made pickle. I might be biased because of the whole pesto-loving thing, but it was probably the best grilled cheese I’ve had in months. And if you read my blog, you’ll know that I’ve had a few in recent months. My only complaint is that the wait for the food to be made was a little long. I heard them discussing with another truck owner that this is due to them preparing everything fresh, but I still hope that, being a newer truck, they figure out how to make fresh and delicious food a little faster. A couple days before this Newark Street Eats, I went to two food truck gatherings in one day for the first time. I’m lucky that my boyfriend enjoys food trucks almost as much as I do, and having him around means getting to share and try more food because of it! 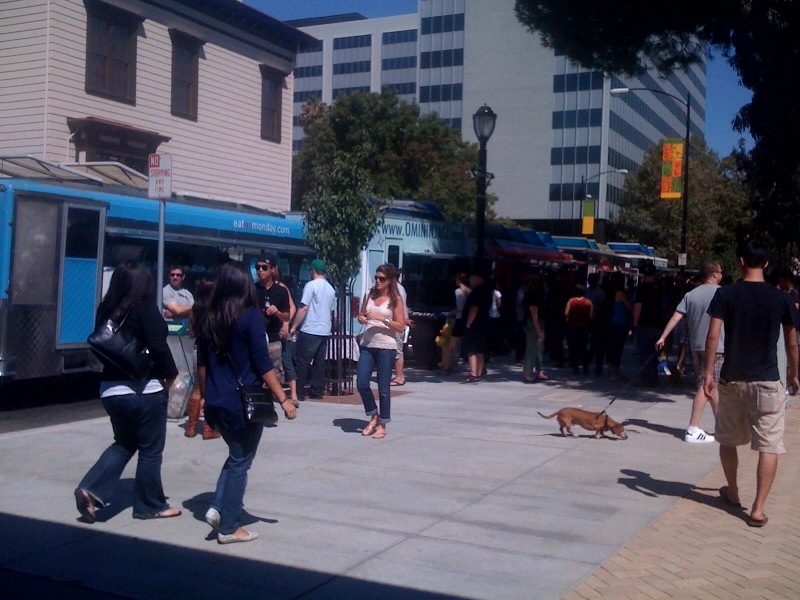 On Saturday afternoon, we went to Moveable Feast, which was teaming up with SJ Made again. 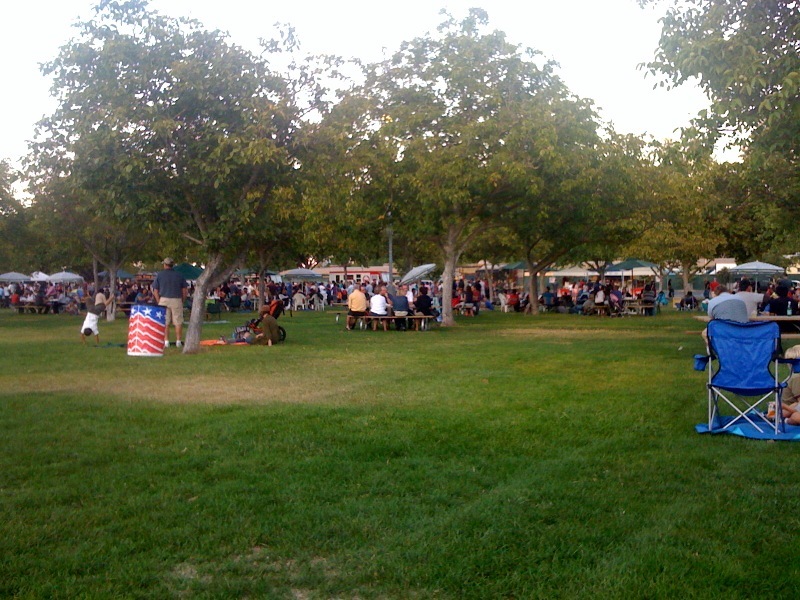 The crowd was the biggest I’ve seen at a Moveable Feast recently. For our main course, we shared an order of garlic noodles from An the Go, and afterwards we each got a veggie taco at Eat on Monday. 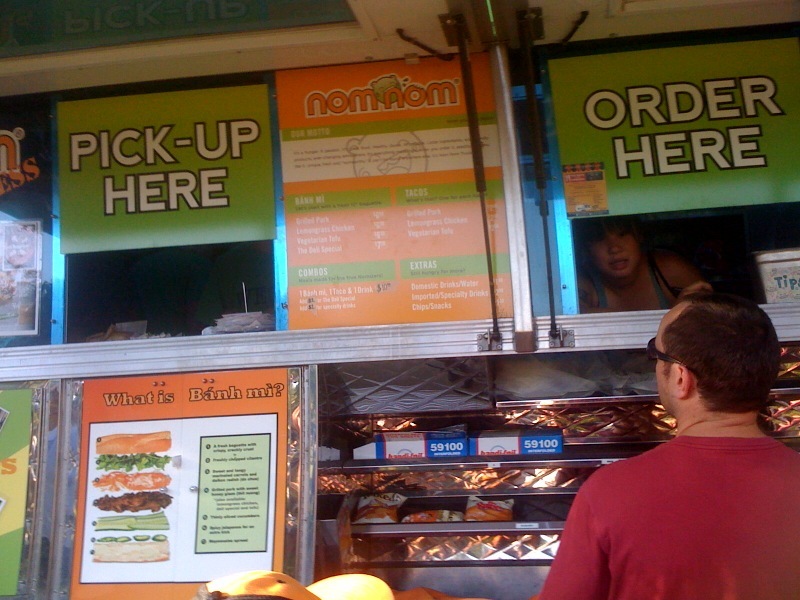 When I wrote about this truck before I mentioned their ever-changing menu and how vegetarian options weren’t common. They tweeted at me saying they’d have more veg options soon, and sure enough, they did on Saturday! Each of their tacos could be ordered vegetarian. I chose the ingredients of the shrimp taco, which included avocado. It was absolutely delicious. 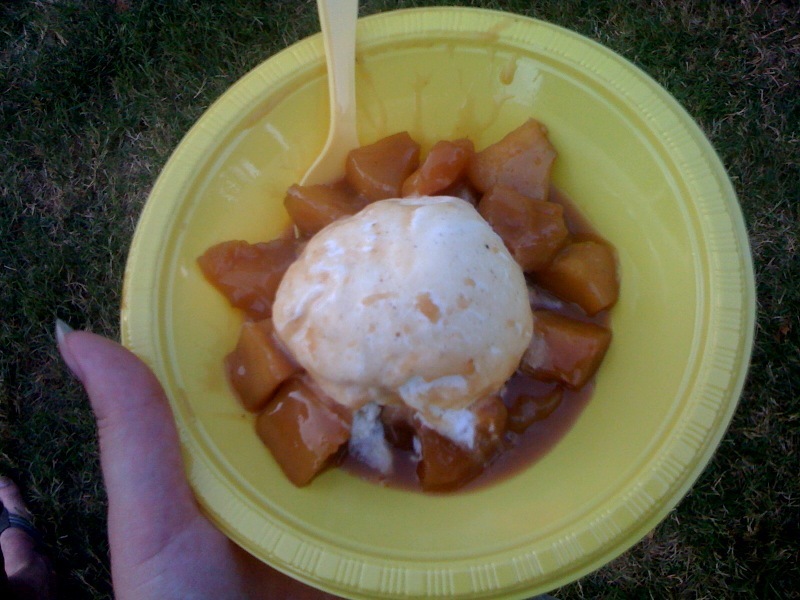 In the evening, we headed to The Gourmet Food Truck Festival at the Alameda County fairgrounds in Pleasanton. Having grown up in Alameda County, I have a lot of memories associated with the fairgrounds. It was fun to come back and enjoy food trucks and nostalgia at the same time. There were lots of trucks, and lots of people. One of the main reasons I wanted to attend was because a truck I’ve been trying to track down both in LA and the bay area, Nom Nom, was going to be there. Like many, I first heard about this truck on the first season of the Great Food Truck Race. I have since been to many Vietnamese trucks that sell banh mi and wanted to try the one I have come to think of as the original. The line was long, but their methods were efficient. 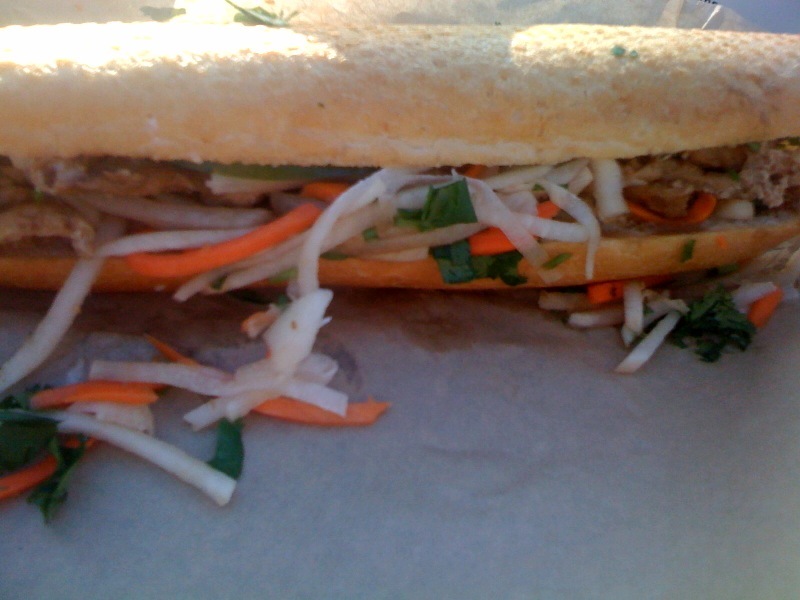 I waited for much less time than I expected, and before I knew it I had tofu banh mi and tofu tacos. 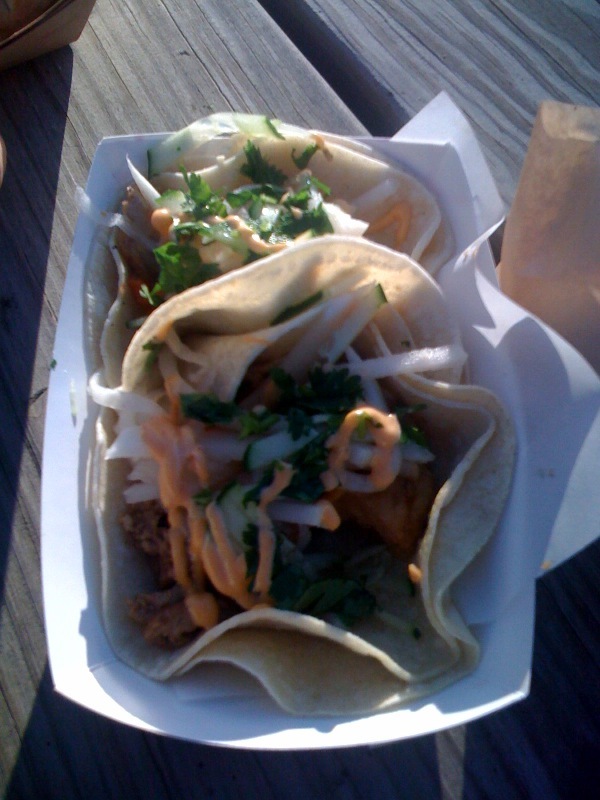 I ended up liking the tacos more than the banh mi, but both were good. 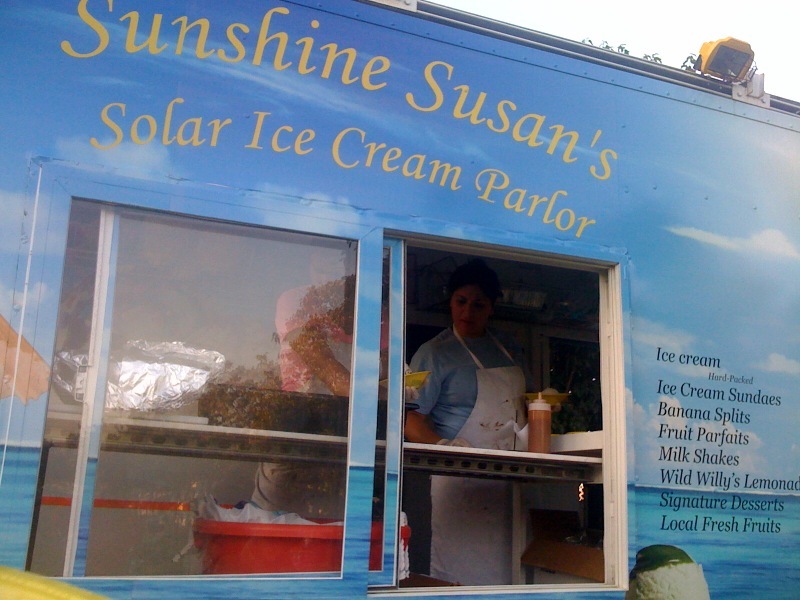 For dessert, we headed to yet another new truck, Sunshine Susan’s Solar Ice Cream Parlor. 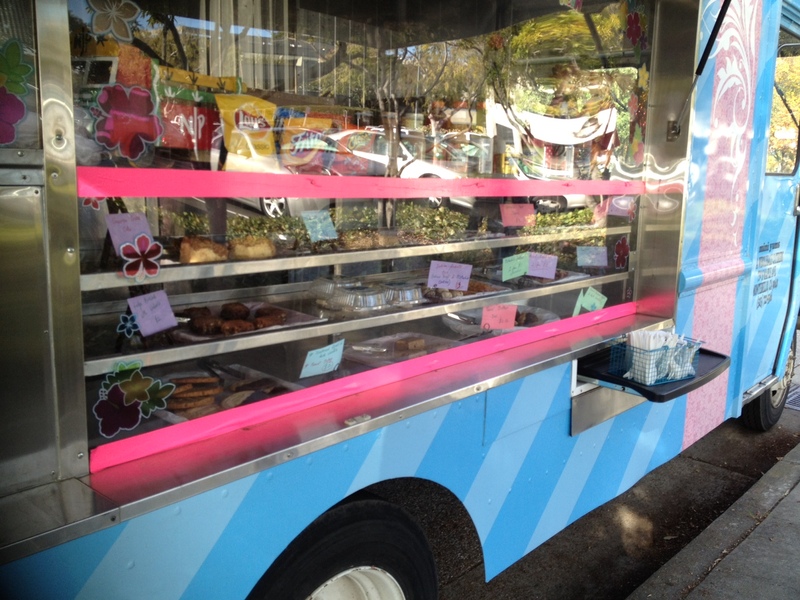 This special dessert truck runs entirely on solar energy. We ordered two desserts whose names I forget since they aren’t listed on their website’s menu. 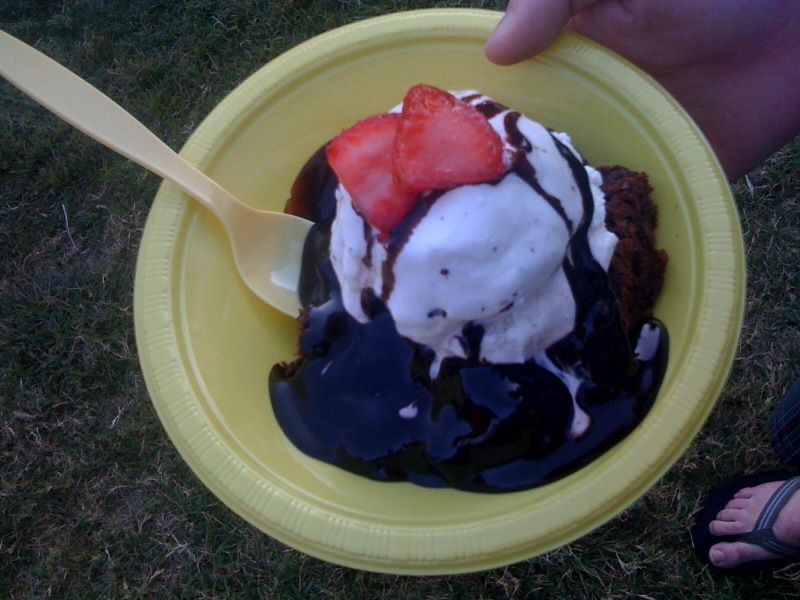 One included apples and vanilla ice cream, and the other was a brownie a la mode. Both desserts were sweet and filling, making us wish we had only split one. At least we’ll know for next time! Four new trucks in two weeks… I don’t think I’ve set a record like that when I wasn’t on vacation in a different city. I’m loving all the new trucks that are popping up. Keep them coming, bay area!